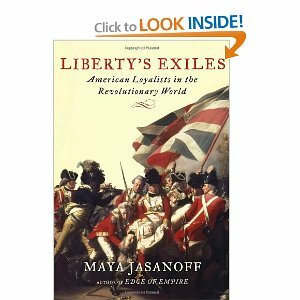 I cam across a fascinating book (just walking around a bookstore) titled “Liberty’s Exiles” by Maya Jasanoff. I read the first chapter and was hooked. Then I came across the video of the author herself. This video is worth an hour of your life. Both The Independent and the New York Times wrote very interesting reviews. If you watch the video and read the reviews you will have a good sense of the value of the book. “On November 25, 1783, the last British troops pulled out of New York City, bringing the American Revolution to an end. Patriots celebrated their departure and the confirmation of U.S. independence. But for tens of thousands of American loyalists, the British evacuation spelled worry, not jubilation. What would happen to them in the new United States? Would they and their families be safe? Facing grave doubts about their futures, some sixty thousand loyalists—one in forty members of the American population—decided to leave their homes and become refugees elsewhere in the British Empire. They sailed for Britain, for Canada, for Jamaica, and for the Bahamas; some ventured as far as Sierra Leone and India. Wherever they went, the voyage out of America was a fresh beginning, and it carried them into a dynamic if uncertain new world. I’ve read the Jasonoff book and think it should be required reading in US high schools as well as in Canadian high schools. I know that when I was in US high school I had no knowledge of the extent of opposition to the declaration of independence by many American colonists (notably in New York City) nor the acts of what today would be described as terrorism by the “Sons of Liberty” and other Sam Adams followers against those who didn’t want to split from the British Crown. The huge gulf in awareness and understanding between Americans and Canadians on both the Empire Loyalist and War of 1812 issues is proof positive that history is written by the “winners,” at least locally, and that what history is taught in the schools isn’t always the truth, all the truth, or nothing but the truth. On a tangential matter, it wasn’t until I was an adult with post-graduate degrees that I starting reading ALL of Mark Twain (beyond Huck Finn and Tom Sawyer), notably his diatribes against US policy, BS propaganda and war crimes especially in the Phillipines during the Spanish-American War of 1898. Never got exposed to any of that in high school (nor to Thoreau’s excellent essay on the duty of civil disobedience, which I discovered during my anti-Vietnam-war days in the US in grad school). I think Twain and Thoreau are the best writers America ever produced, and they both have been heavily-censored in the public school system down there.